During the past week, I (Eva) have been in Japan for the STINT Leadership Summit (Kyoto), the STS Forum (Kyoto), a visit to the Tokyo Institute of Technology (Tokyo Tech) and the MIRAI Seminar (Tokyo). This year is the 150th anniversary of diplomatic relations between Japan and Sweden. We have already participated in the celebrations through the exhibition “The art of natural science in Sweden: treasures from Uppsala University” in Tokyo. The anniversary has received renewed attention this week through the Sweden–Japan University and Research Leadership Summit in Kyoto. The meeting is a follow-up of the University Presidents’ Summit in 2015, when a large delegation representing Swedish universities travelled to Japan. On that occasion, Uppsala University was represented by Deputy Vice-Chancellor Anders Malmberg. The topic of this year’s meeting was Impact from Strategic University Initiatives – a reference to MIRAI, which was a result of the meeting in 2015. Some thirty university heads and representatives of research funding bodies discussed what is needed to strengthen cooperation, what obstacles exist and the future outlook after MIRAI. Many participants emphasised younger researchers, the link between education and research, joint research schools and interdisciplinary topics. Several argued the need for a long-term perspective, persistence and predictable funding. Some also pointed out that we have several ingredients required for success, such as trust and confidence in one another, shared basic values and a long history. The session was moderated by Sylvia Schwaag Serger, Chair of the Swedish Foundation for International Cooperation in Research and Higher Education (STINT) and Deputy Vice-Chancellor of Lund University. The visit to Japan continued with the Science and Technology in Society (STS) forum in Kyoto, in which I participated on Sunday and Monday. STS is an annual event that was being held for the fifteenth time and that brings together academics, politicians and other stakeholders for relatively informal open discussions. The best thing about it was networking with colleagues from Sweden and different parts of the world. I was able to continue conversations that had begun the day before with Japanese colleagues. The Guild universities were well represented at the University Presidents’ lunch meeting where the discussion centred around two topics: “The university as a platform for change” and “Cultural attributes for success over the centuries”. The next stop was Tokyo on Tuesday and a visit to the Tokyo Institute of Technology. 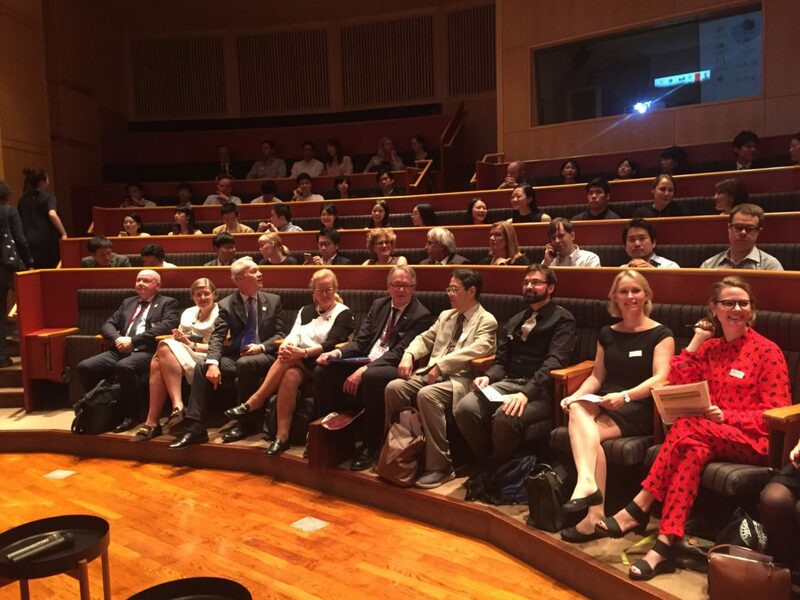 Uppsala University has engaged in collaboration with Tokyo Tech since 2014, with annual symposiums, the latest of which took place recently in Uppsala. We have research cooperation in several thematic areas, such as energy systems and environmental technology, mathematics, nuclear engineering, and medical radiation, and we also have a university-wide agreement on student exchanges. During my visit to Tokyo Tech, I visited Dr Koshihara’s lab (spintronics) and the Environmental Energy Innovation Building, where the entire façade is covered by solar cell panels developed at Tokyo Tech. MIRAI is the name of a project being conducted in 2017–2019 to promote increased collaboration between Japanese and Swedish universities, with the support of the Swedish Foundation for International Cooperation in Research and Higher Education (STINT). It involves a total of 15 universities, seven from Sweden and eight from Japan. Three themes have been chosen: Ageing, Material Science and Sustainability. MIRAI focuses on enabling researchers to make international contacts at an early stage of their career. Nearly 300 people are participating in the meeting in Tokyo, which runs until Friday. I heard many interesting presentations, including one by the Japanese Nobel Laureate Professor Hiroshi Amani from Nagoya University. The next meeting will be held in Stockholm in November 2019 but discussions are already in progress on MIRAI II and the outlook from 2020 onwards. If you would like to know more about MIRAI, you can contact Ulrica Ouline ulrica.ouline@uadm.uu.se or Leif Kirsebom. While in Tokyo we took the opportunity, as usual, to organise a joint alumni event with the other Swedish MIRAI universities. Nearly 200 alumni turned up at the Swedish embassy to meet us and one another. There were many happy reunions and memories. These events are greatly appreciated by alumni, and the most common question was when the next event will be. Alumni are our true ambassadors. The participants from Uppsala University were Dr Yasmine Sassa (Dept of Physics and Astronomy), Dr Daniel Globisch (Dept of Medicinal Chemistry), Dr Malgorzata Blicharska (Dept of Earth Sciences), Dr Wei-Chao Chen and Dr Sethu Saveda Suvanam (both from the Dept of Engineering Sciences), and Dr Jonas Mindemark and Dr Erik Lewin (both from the Dept of Chemistry). Dr Malin Graffner Nordberg (UU Innovation) and Dr Ulrika Persson-Fischier (Dept of Engineering Sciences) took part in an innovation seminar.